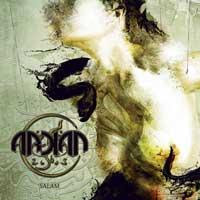 "Salam" is Arkan's second record; based in Paris, they play melodic death metal mixed with oriental influences, a bit like Orphaned Land (by the way: OL singer Kobi Farhi does the guest vocals on the track "Deus Vult".) If you are open minded, check the song! Great stuff, I think. Deus vult means God wants it. So it's the latin translation of the arabic insha'allah. This word again turned into the spanish/ portuguese word ojalá/oxalá - "hopefully".